P.P.C.L.I., C.E.F. - "Ypres, 1915, '17, Frezenberg, Bellewaarde, Mount Sorrel, Somme, 1916, Flers-Courcelette, Ancre Heights, Arras, 1917, '18, Vimy, 1917, Arleux, Hill 70, Passchendaele, Amiens, Scarpe, 1918, Hindenburg Line, Canal du Nord, Pursuit to Mons, FRANCE AND FLANDERS, 1914-18"
SIBERIA, 1918-1919 SIBERIA, 1918-1919 On 3 November 1997, the regiment was granted the perpetuation of the '260th Battalion, Canadian Rifles, CEF (Siberia)' (NDHQ Memorandum 1065-1 (DHH), 30 October 1997). P.P.C.L.I., Canadian Active Service Force - "LANDING IN SICILY, Leonforte, Agira, SICILY 1943, The Moro, The Gully, LIRI VALLEY, Hitler Line, GOTHIC LINE, RIMINI LINE, San Fortunato, Savio Bridgehead, Naviglio Canal, Fosso Munio, Granarolo, ITALY 1943-45, Apeldoorn, North-West Europe, 1945"
Princess Patricia's Canadian Light Infantry: 1914-1919 by Ralph Wilfred Hodder-Williams - with a foreword by the Lady Patricia Ramsay ... and an introduction by Lieutenant-Colonel A. Hamilton Gault. 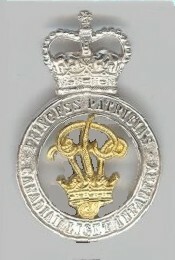 2nd ed.Edmonton: Princess Patricia's Canadian Light Infantry, Executive Committee, 1968. 2 v. in 1. 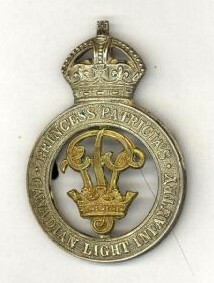 Princess Patricia's Canadian Light Infantry 1914-1919 by Ralph Wilfred Hodder-Williams with a foreword by Lady Patricia Ramsay; and an introduction by A. Hamilton Gault. London: Hodder and Stoughton, 1923. 391 p.
The Patricias: the proud history of a fighting regiment by David Jay Bercuson. Toronto: Stoddart, 2001. 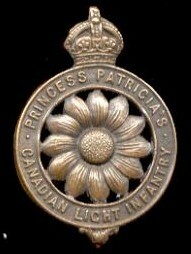 347 p.
Princess Patricia's Canadian Light Infantry: 1919-1957 by G.R. Stevens with a foreword by Patricia Ramsay; and an introduction by A. Hamilton Gault. Montreal: Southam Printing, 1958. 411 p.
The Story of Princess Patricia's Canadian Light Infantry, 1914-1917 [microform] by R. Richards. London: Printed and published for the Canadian War Records Office by Charles and Son, . 1 microfiche.